Small - $19.99 Only 8 left! Medium - $19.99 Large - $19.99 Only 9 left! All these girls are out here trying to be princesses and you're stirring a cauldron full of potion while practicing your most devious cackle. 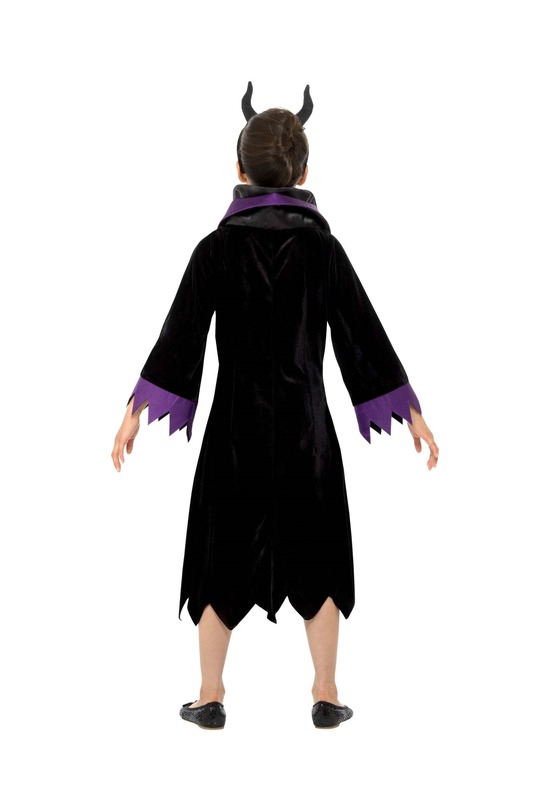 We love your allegiance to the wicked ones and once you possess this evil queen costume for girls, your sorcery skills will skyrocket because you'll be cloaked in mystery and determined to create misery. (Insert your best evil cackle here.) This costume prepares you for life as a wicked fairytale queen. Currently, your head is devoid of horns but some evil queens out there (not naming any names) rock a perfectly sharp pair of horns and they make them look so appealing. You'll also get experience wearing a high collar which creates a seriously sinister vibe instantly. Now all there's left to do is gaze at your reflection in an ornate mirror or bewitch a fruit and you'll be well on your way to sitting on a throne in the wicked queen hall of fame. This costume veils future queen in a long robe-like dress with tattered sleeves and hemline. The pullover-style dress is made from ultra-black, soft and velvet-like fabric creating a luxurious yet leery appearance that says, "I'm probably up to no good." A satin royal purple stripe is directly down the middle as well as around the sleeve cuffs and the collar. Finally, a headband featuring plush black horns is also included with this costume. If you want more help cultivating your inner evilness (mwahaha) then there are a couple accessories to pick up to give your costume a spellbinding edge. Purple makeup looks great applied to the eyelids and add a black cape to twirl when disappearing into the darkness. A small gold crown can be added to top off the look. Everyone will love it, except some uppity princesses, but we'll refrain from mentioning their names.